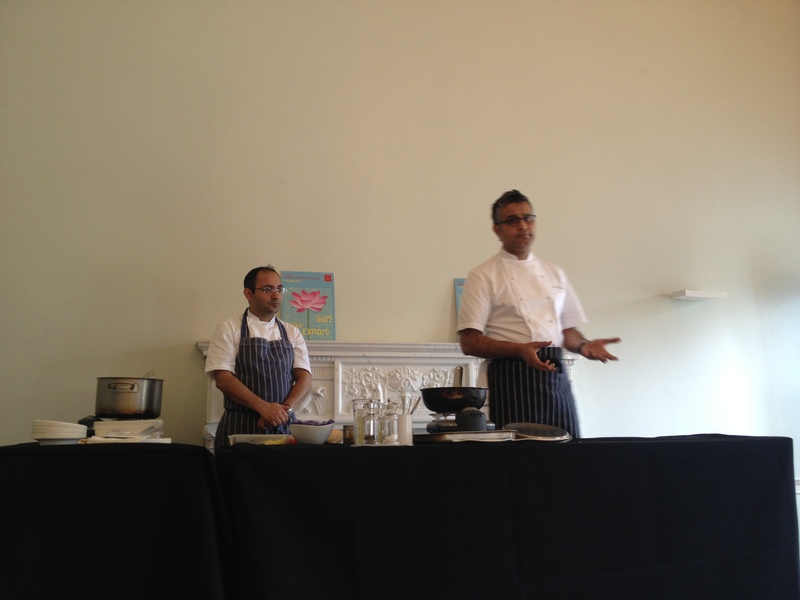 “There is no such thing as Indian food,” says Atul Kochhar, head chef of Michelin-starred Indian restaurant Benares, to an assembled crowd waiting for his cookery demonstration at London’s Asia House. An odd statement, perhaps, coming from one of the UK’s foremost Indian chefs, and yet it says more about his cooking than perhaps anything else he could say. Having trained at the famous Indian Oberoi hotels, he came to the UK from Delhi in 1994, winning his first Michelin star for restaurant Tamarind in 2001, and another for Benares in 2007. He has made a name for himself on television and in print, and still manages – unlike some ‘celebrity’ chefs – to put in some serious hours in his various successful kitchens. But while his is irrefutably what we in Britain would see as ‘Indian’ food, Kochhar’s approach is actually mixed, taking influences from the UK and the rest of the world in full appreciation of how far Indian cooking has come. 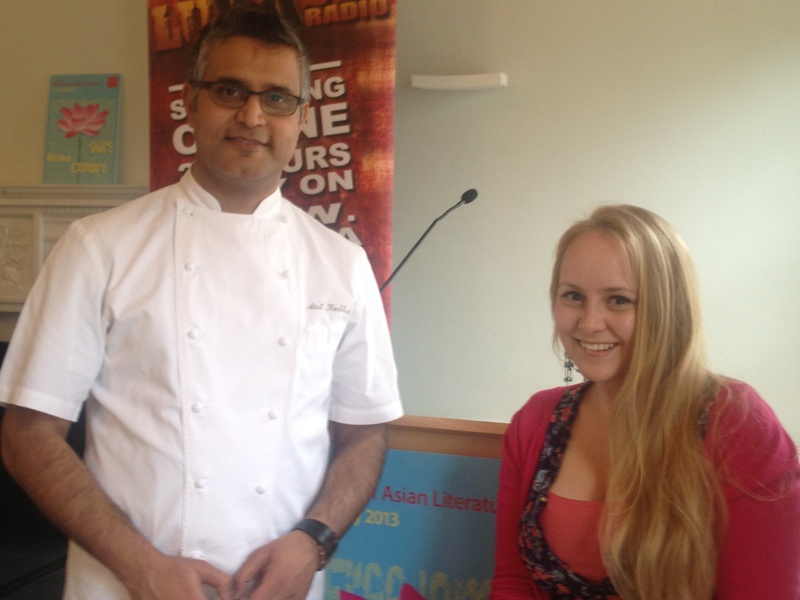 This, in fact, is the subject of his new book, Atul’s Curries of the World. Published just two months ago, it is a celebration of curries from around the globe – a whirlwind tour of a dish which ostensibly came from the sub-continent, but now belongs to everyone everywhere ‒ in countries such as Malaysia, Indonesia, Britain or South Africa ‒ often having changed beyond recognition. “That’s a very interesting story. If you look at Malaysia, the curries have taken local ingredients on – lemongrass, lime leaf… When you migrate to a country, you do it wholeheartedly or you don’t,” says Kochhar, relating this to his own open-minded approach to using local ingredients. “You can’t sit on the fence and say ‘No, I’m from India.’ Follow your own tradition, but use the produce of the country. Food is the biggest form of integration,” he adds. 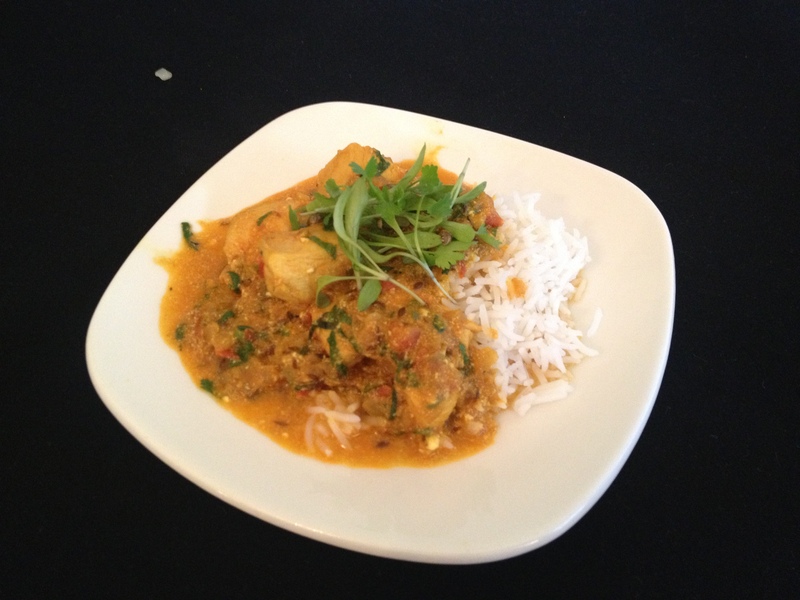 And yet, for his Asia House demonstration, Kochhar has chosen to pay homage to his roots. Cooking Lahori Murgh (Chicken from Lahore, Pakistan), he explains that his father’s family came from what is now Pakistan, at a time pre-Partition when it was still just another part of the Indian Punjab. “Pakistan has always been a great place for me,” he tells me. “And Lahore has always been a gastronomic centre. Unfortunately, I’ve never been to Pakistan, but my family came from that part of the Punjab. Kochhar spends a long time explaining this philosophy to the audience, taking pains to ask us to consider how non-homogenous – and yet so varied ‒ Indian food is, as his executive chef from Benares (here to assist) gently stirs a huge pot of rice in the background. Unsurprisingly for someone who has made a successful TV career for himself, Kochhar is as good-natured and adept in front of an audience as he is behind a stove. As soon as the onions go into the pan, wafting their incredible aroma into the air, it feels exciting. Here is a famous chef, with a book, TV and multiple-restaurant career, cooking chicken curry for this one small audience, on this random Saturday. Why would he choose to do a demonstration at this kind of low-key event, I ask him, with such a successful, starry and varied a career as his? And he is completely at ease, explaining the three ways to cook Indian onions (from clear for kormas, golden brown for masalas, to dark for rogan josh-type dishes) and how important oil temperature is, making jokes about how much spice to add and refuting the recommended amounts in his book as rubbish. “Watch carefully,” he says in mock-seriousness, as he bungs in a random-looking amount of brightly-coloured powder, once, twice, three times. “Book publishers always say you need a measure,” he says, “But spices should always be like seasoning – you use the spices according to your own personal taste. And he moves on to take audience questions, adding tomatoes, chicken and – oh, quite a lot – of green chilli. The smell of perfectly-balanced flavours fills the room. As the mixture bubbles away, a debate begins about the merits of ginger garlic paste, which Kochhar says can be used in this dish. If you want to, homemade is best, he says, and should be added after the onions are ready. Talking of onions, Kochhar is clear that they can really make a difference. One day, he explains, his wife – Deepti ‒ made a dish and it tasted so good, he asked what was different (“She’s a great cook, don’t get me wrong!” he jokes). She was using Indian onions, he realised, which are stronger, pinker, and have less sugar. “They were selling them in Tesco and cheaper than the others, so I bought them,” Kochhar remembers her saying. “Good answer,” he nods. But despite all this talk, no-one could forget about the curry being cooked right now, slowly simmering away in the silver pan. And when it’s served, it’s delicious. Even the small portion metered out (so that everyone can have a bit) is enough to tell. From such familiar, un-showy ingredients, it’s fantastic: fragrant and delicate, the chicken is succulent and perfectly dressed, with just the right amount of spice and garnish to crush warmly in the mouth, and just enough sauce to cover the flawlessly-cooked rice (an amazing feat in such a makeshift kitchen setting – we’re using camping stoves, here). So simple. 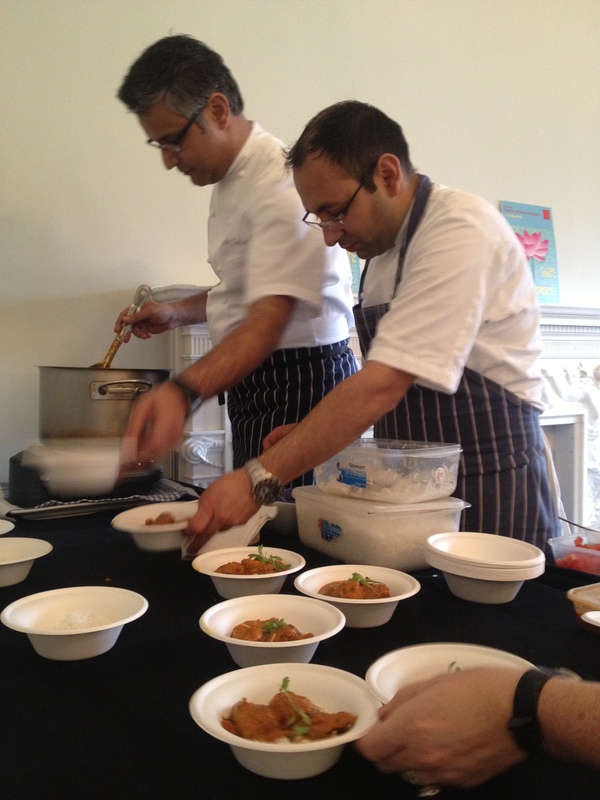 From the beginning, Kochhar has handled the room, the audience, the pan, and the plate with relaxed poise. As he takes questions from the crowd, stands around as book after book is handed to him to sign, discusses question after question with people who insist on telling him just how their Indian mother made it, and smiles good-naturedly again and again as people ask for their photo to be taken with him, he quietly radiates the the calm look of a man at peace with his cooking, and, as befits his open-minded approach, at peace with a world that offers up such inspiration. At the end of the demo, I ask Kochhar’s executive chef what he is like as a boss. “Tough, like all bosses are, but he allows me to be creative,” he says, telling me that despite training at Oberoi (like Kochhar), before meeting the chef, he hadn’t really worked with Indian food. 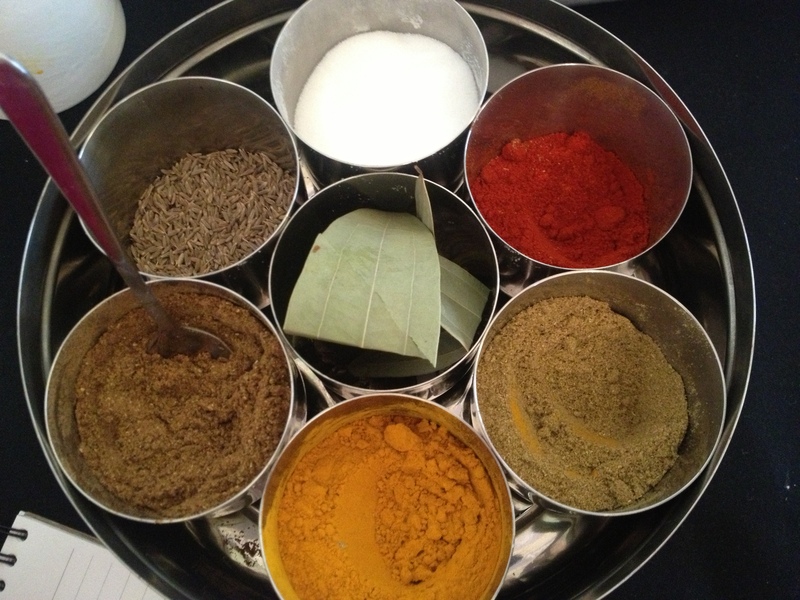 “I told him I wanted to learn how to work with spices, so he offered me a chance at Benares,” he explains. He’s been there ever since. Kochhar may believe that there’s no such thing as Indian food. And yet, if he is anything to go by, I’d say there definitely is such a thing as an Indian chef – and a brilliant, down-to-earth one at that. If there’s one thing I love, it’s watching cooking programmes, and cooking. The former can be pretentious, unrealistic, and often less about food than the person cooking it, but I find that they all come from a great place – seeing food as not only the way to the heart, but also to happiness. Many a Saturday morning has been idled away by my doing nothing but drooling over Saturday Kitchen (and yes, ok, having James Martin as presenter certainly helps). For me, food is sometimes a double edged sword; I absolutely love great food, eating, tasting, dipping, feasting, sharing, celebrating, commiserating – for me, food is life, but due to an unholy combination of genes, errant hormones, and endless appetite, I put weight on horrifyingly easily, so quite often a short-term burst of enthusiasm and continued delight at a wonderful spread is darkly tempered by pounds of not-so-lovely flab that seemingly refuse to budge no matter how much I eat fruit instead of chocolate, or how many Zumba classes I sweat through. I sense that for me, food must always be a matter of balance, and since its consumption need sadly be limited, the very least I can do is enjoy what I do eat to the very best of my ability. Fittingly, watching TV chef Rick Stein’s latest programme, on Spain, I was struck by how familiar many of the apparently unusual culinary flavours and concepts explored in the programme seemed, and how much they spoke to me of my childhood, and what food means to me. When it comes to food, I have had quite a blessed and varied past. Being brought up by parents, especially my mother, who have an open approach to good quality, fresh food, in a household where, come hell or high water, dinner was cooked from scratch or damn near it, and served around a table with all family members, no matter how reluctantly, present, for me, food has always been a constant; a reassuring presence. No matter what is happening, how traumatic or stressful the situation or the relationships therein, there will be food, and nine times out of ten, it will be good. Also, having been brought up firstly around the food markets and rural setting of Somerset, then those of the South of France, and then the somewhat more urban but still food-obsessed Madrid in Spain, with a fluent-Spanish speaking Argentine father, the fare on offer has usually been of a somewhat Mediterranean flavour. I still wouldn’t know how to begin to make Thai green curry without a jar, and to me Asian noodles are nought but spaghetti by another name, but give me basil, parsley, seafood, tomato, pasta, rice, onion, and, of course, lashings and lashings of garlic, and I’m there. 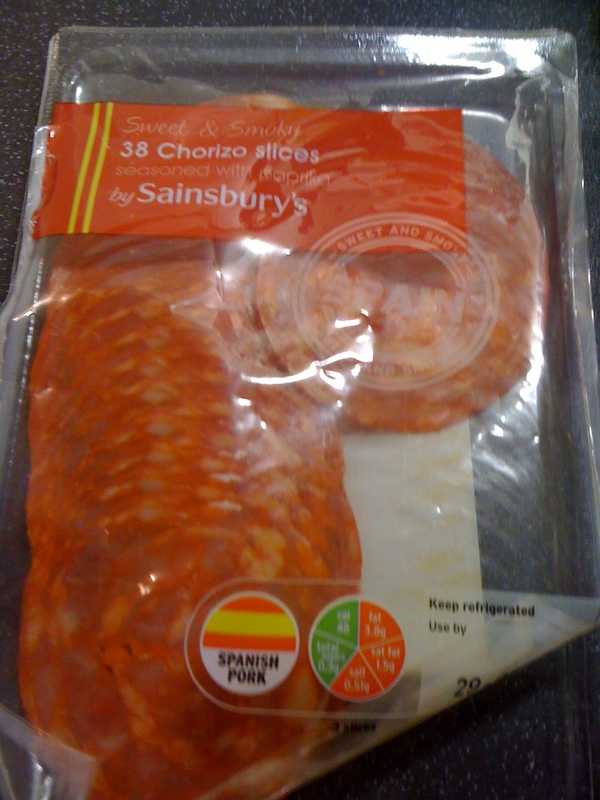 Missing from that list, and wrongly so, is chorizo*. Ah chorizo, thy paprika’ed god of many forms! Luxurious in texture, colour and flavour, the addition of this smoky flesh into near any dish I set about to create (often, sadly, fried first and then drained to reduce fat content, sigh) completes the meal with unparalleled glory. One ex-boyfriend was vegetarian and made me put any chorizo on the bottom shelf of the fridge, wrapped in nuclear-resistant amounts of cling film while I grimaced over throat-stickingly disgusting ‘meat substitutes’ instead. I should have known it would never, ever work. 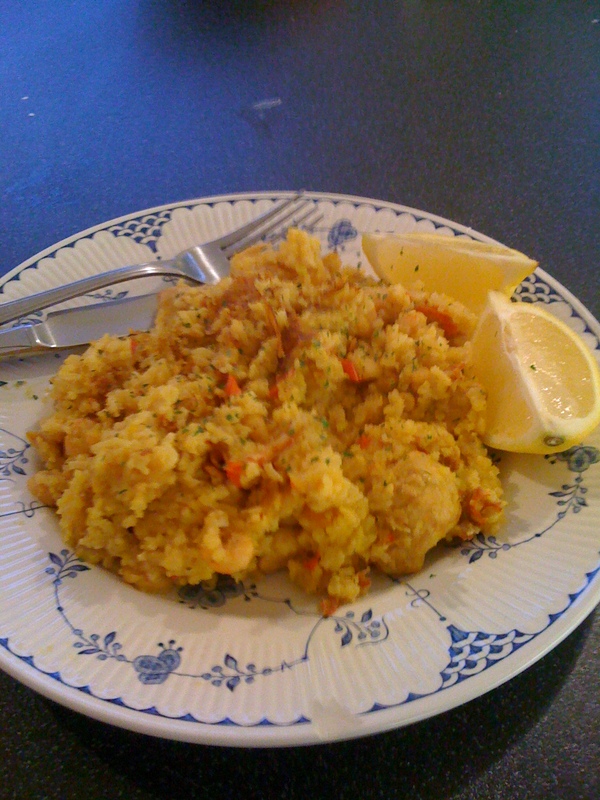 And so, thankfully, to paella^. Other people, perhaps, have childhood memories of baked beans, white bread, sausages, fish fingers and loads and loads of mashed potato. Apart from violently hating baked beans, I too have such memories, with much else besides. But one of the most potent culinary images of my childhood is of my father, coming home from work on a Friday night, and slicing disc after nearly-translucent disc of chorizo, popping them into his mouth insolently as my Mum tutted and resumed the ‘proper’ dinner cooking, pausing only to snaffle generous portions of slices from my Dad’s now-orange chopping board, as my brother and I did the same. It was from my Dad that I Iearned to hold the chorizo (always ‘picante’, never ‘mild’) firmly, and, with a sharp knife, slice it thinly and evenly, so that the flavour can be appreciated without the unpleasantness of too-large globules of fat getting stuck in your teeth. Nobody wants that. If adding to an omelette, you can always chop the slices a little thicker, before halving them and halving again into small cubes of loveliness, but if adding to paella, keep slices round and intact for maximum effect. It is with a slightly sinking heart that I use ready-sliced chorizo these days, in an attempt to keep costs and cooking time down. My Dad would be horrified if he knew (as my Mum would be if she found out I often use ready-grated Parmesan for similar reasons. Merely typing such heresy sends an unwelcome shiver down my spine. Sorry Mum). 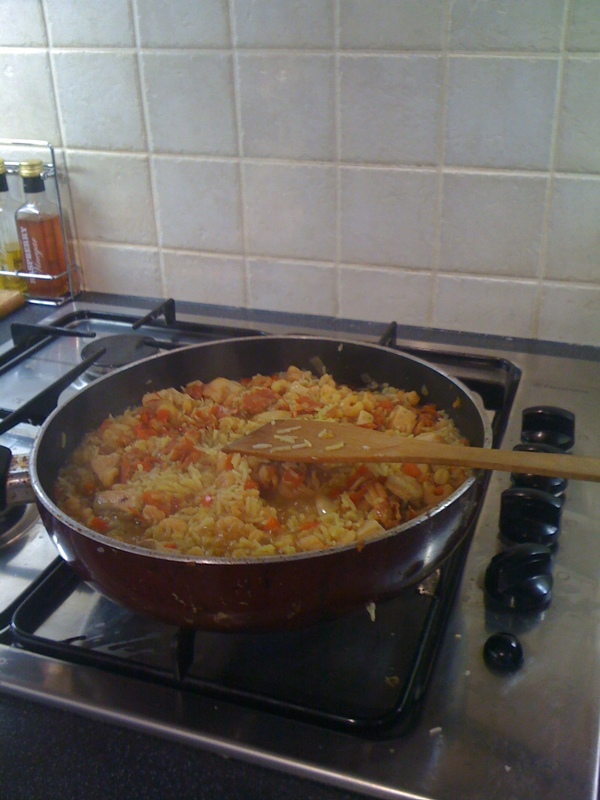 The only time snaffling cuts of chorizo is not allowed, I warn you, is when my Dad is cooking paella. Unlike my Mum, who can, if she feels like it – obligatory grumbling notwithstanding – whip up a fantastic plate of food with minimal fuss and effort, my Dad is like an aging Emperor in the kitchen, only coming out at weekends, holidays and special occasions, surveying all he owns (in this case, the awesome plains of the kitchen sideboard) with beady eyes and banning all but necessary minions, which usually means everyone (once the de-boning and shelling of the jelly-like squid and gambas have been achieved), from his Cooking. Much wiping, tidying, precise chopping and preparing, growling and expletive-exclaiming later, my Dad will emerge from behind a great bronze vat of pungently fragrant, ochre rice peaks, peppered with splashes of seafood, chunks of chicken and deep red jewels of chorizo, always accompanying such progress with a muttering refrain about how it’s not quite right, to which my Mum invariably responds with ironic, under-her-breath mentions of her mother in law, who apparently used to say the same thing whenever she cooked. And yet, following carefully administered but abundant streams of bittersweet lemon juice over the yellow mountains, my Dad’s paella is the best I’ve ever tasted. I have so far found only one restaurant offering that even comes close (tucked delectably away behind Calle de Gran Via in Madrid), and even that is but a pale imitation of what my Dad has variously served on many a weekend, holiday or family gathering throughout my childhood. If it’s just my immediate family, we’ll all have seconds…and if the group includes friends, cousins, uncles, aunts and grandparents, then er…my Dad will just cook more, and we’ll still have seconds. Once, mercifully when it was just my Mum, Dad and brother, the chorizo was mistakenly forgotten, and a great cry went up across the land. Thankfully, a solution was found, and we just added it in afterwards, sprinkled over the bereft pan like water over a sun-cracked plain. I have learned to make the dish, and cook it probably much more frequently than I should, given its expensive ingredients and ‘special occasion’ status, but cook it I do, such is its power to remind me of comforting home cooking, of careless Friday evenings or long, lazy holidays, where living in France meant summer nights with family or friends sitting outside in the simmering, dying heat of the day, eating, drinking, talking or simply listening in silence to the glorious hum of cicadas, as the warm haze of satiety and tiredness washed over in waves (before you had to get up and do the washing up of course. Needs must). OK for a weekday...from pot to plate in under an hour! I still don’t do it as well as my Dad, and if cooking only for myself, sneakily never use the proper ingredients in an attempt to reduce supermarket bills and time spent over the stove. Instead of using chicken thighs, I use breast, which I cook sparingly before adding to the pot in an attempt to avoid the inevitable drying of the meat that could so easily occur. I use cheap, frozen prawns in lieu of freshly-bought, labour-intensive slews of squid, mussels and unshelled gambas. I use (whisper it) chicken stock from a cube rather than making my own from the seafood shells; I hardly ever add white wine; and as mentioned previously, use pre-sliced chorizo instead of dicing up a proper sausage. However, of course, I always use proper saffron, despite it being eye-poppingly expensive (I use less than I’d like to make it go further), and always use, as my Dad insists, basmati rice rather than the short, stubby, Spanish variety – not sure where that rule comes from, but I’m sticking to it. Also, to save on calories, I add far less chorizo than I’d like, and use spray olive oil rather than the magnificently golden liquid kind, which, if I was skinny, I wouldn’t hesitate to pour over in generous glugs. I resignedly accept that my weekday paella is but a poor imitation of the master’s, but it means I can go from chopped onions to steaming, nostalgic plateful in only an hour – something the Kitchen Emperor would never countenance. Rick Stein’s childhood memories may involve the gruesome-sounding Spanish platter of squid cooked in its own ink, but when it comes to my childhood, my heart and tastebuds will always be forever my Dad and Mum, paradoxically but forever France, forever chorizo, and, irrevocably, forever paella.